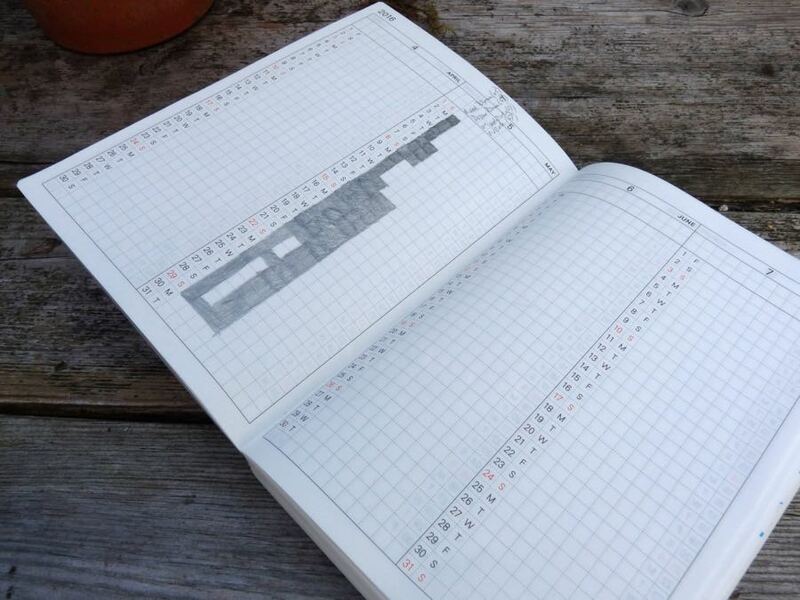 A lot has been written about the Hobonichi Techo. It has almost cult status. Here are some more words about it, based on how I’ve used mine for eight months. Of course one of the difficulties of reviewing planners when you try not to review anything without using it for a while is that the review is always going to be out of date. I hope, though, that this might help you decide if you want to by yourself one for 2017. 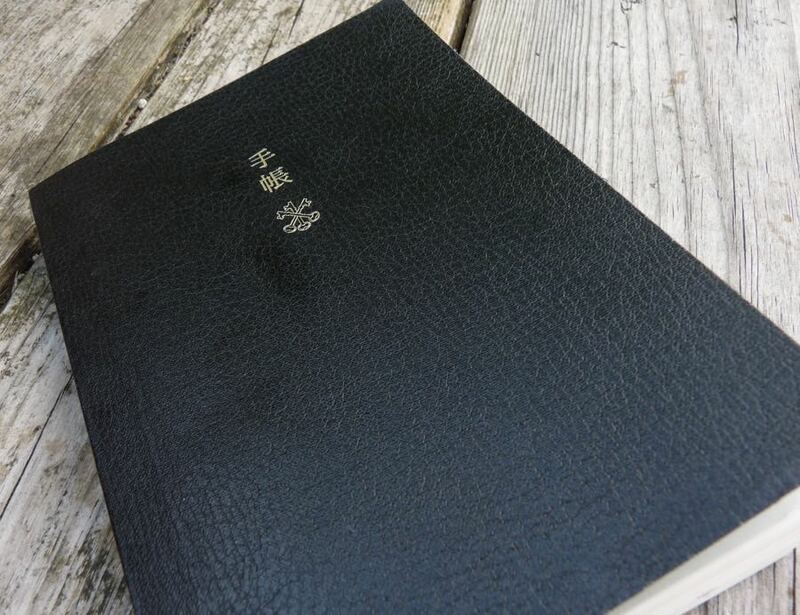 The outside of the Techo is textured thin black card with Techo in Japanese characters and the three-key Arts&Science logo. Arts&Science developed this English language version of the planner. This cover, along with the very thin paper, makes the Techo look very much like some kind of holy book, and I wonder if this contributes to some of cult-like adoration that surrounds it. It makes you feel as if you’re using something very special. Of course, there are dozens if not hundreds of cases available for it, at every price point imaginable. Mine, however, sits naked on my desk in my custom-made Dudek Divide. 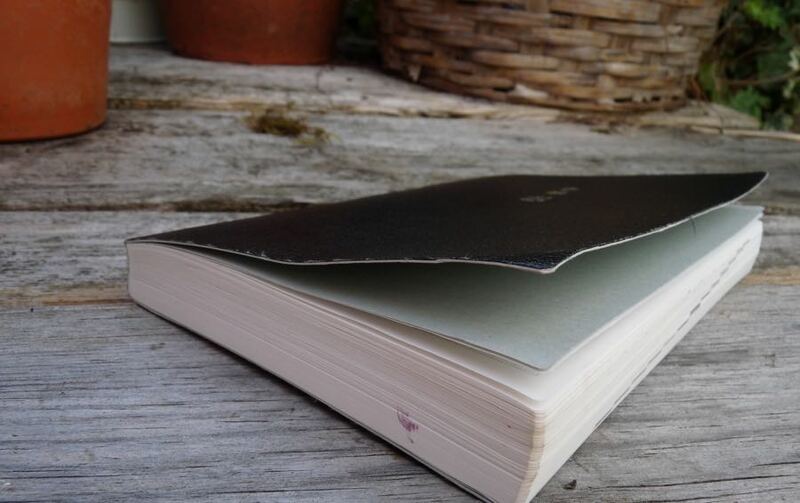 It’s hard to believe given the thickness of the Techo but it contains 450 pages. The reason it’s so slim is that these pages are made from Tomoe River paper. This paper is extremely thin and light but handles ink incredibly well. There’s no bleeding, no feathering, and surprisingly little show through (though it is there). Fountain pens are fantastic on it and inks show everything they’ve got. Because it’s so thin, if you’re using a pen or pencil that requires some pressure, you’re in danger of marking several pages below too but, really, the whole appeal of this paper for me is how lovely it is with fountain pens. The only downside in this respect is how long it can take for ink to dry. Each page lies flat, too. 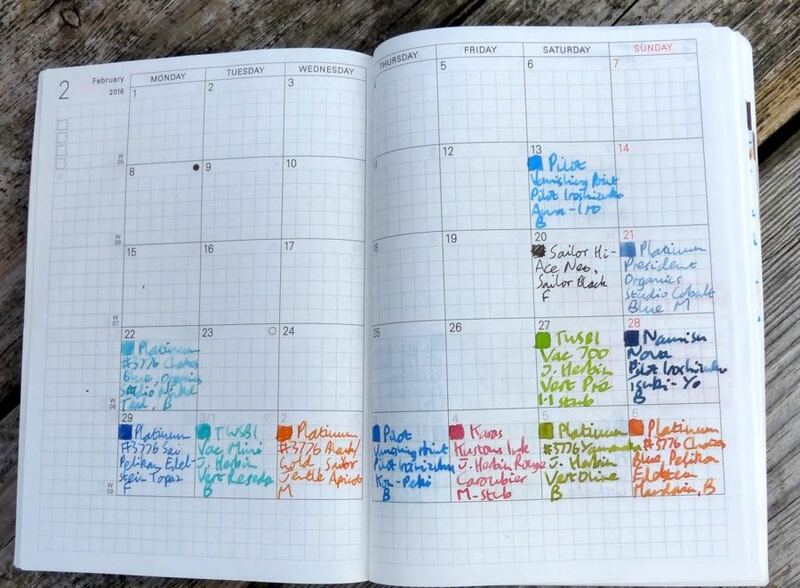 Everyone uses a planner in a different way and a good planner should provide some structure (otherwise it’s just a notebook) without getting too dictatorial. 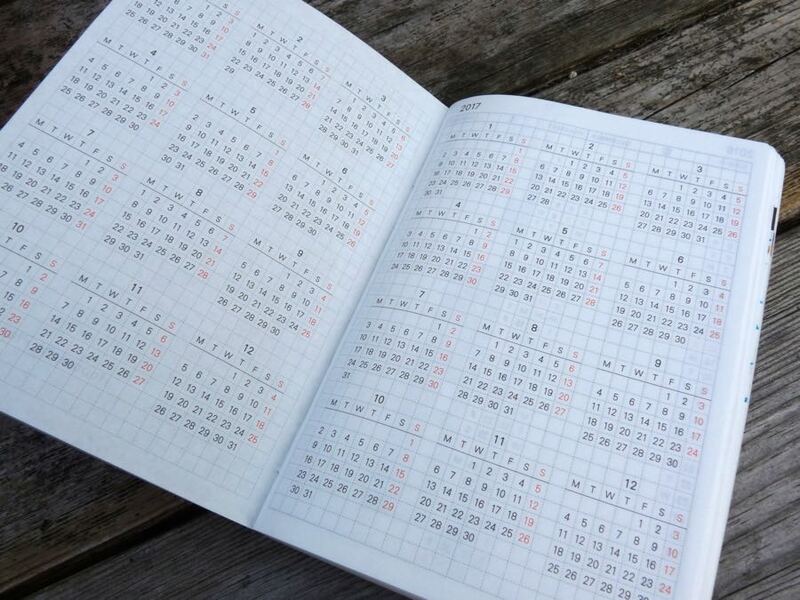 The Techo provides lots of structure but most of it is easy to ignore, work around or adapt if you don’t actually want to use it exactly as laid out. In fact it slices up the year in so many different ways you probably don’t need to use every part. This can be hard! Most of us feel compelled to use every page of every book but be strong! Your sanity will thank you for it. The first couple of pages have this year and next laid out with the months numbered rather than named. This is followed by pages each with two months laid out in columns, starting with December 2015 and ending with March 2017. 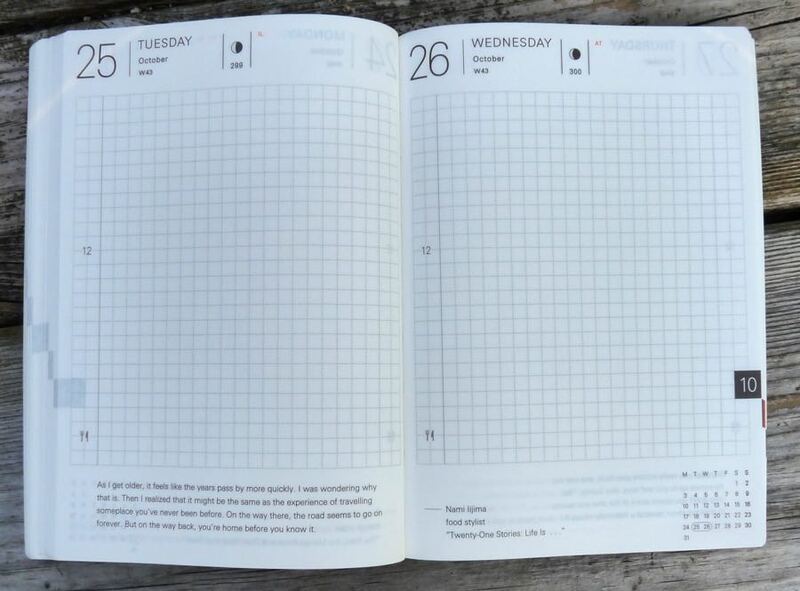 These pages, in common with the rest of the planner, are laid out on a 4mm grid. I did briefly use this section for Jerry Seinfeld’s Don’t Break the Chain hack but it’s not for me so this section is pretty much blank. Next up we have months from December 2015 to March 2017 with each month laid out over two pages. I’ve used this section to record pens and inks I’ve used, with some temporal licence used when I’ve inked up more than one pen in the same day. We’re getting to the meat of the planner now. 16th December 2015 to the end of 2015 is laid out with two days per page, then 2016 is laid out with one day per page, followed by the first week of 2017 on two days per page again. This is where I record my three plus one good things: three good things that happened that day (one sentence each) and then one extra good thing that I write more about. This is a habit I’ve had for something like four years now (possibly longer, I can’t remember). At the start of the year I illustrated something from the day, too, but I soon fell out of that habit. I also, because I’m English, record the weather and, because I’m a pen nerd, record the pen I used. The margin of each page has ’12’ written halfway down and a knife and fork at the bottom. I ignore these completely. The top of the page has the date and day, of course, the week number, the day number, and the moon phase. It also has the initials of countries that celebrate that day as a holiday. (Took me ages to work that out.) The right hand page has the month number, and these numbers move down the page with each month. The bottom of each pair of pages has a quote. Some of these quotes are thought provoking but many are a little inane. Still, it’s fun to turn the page and read the next one. 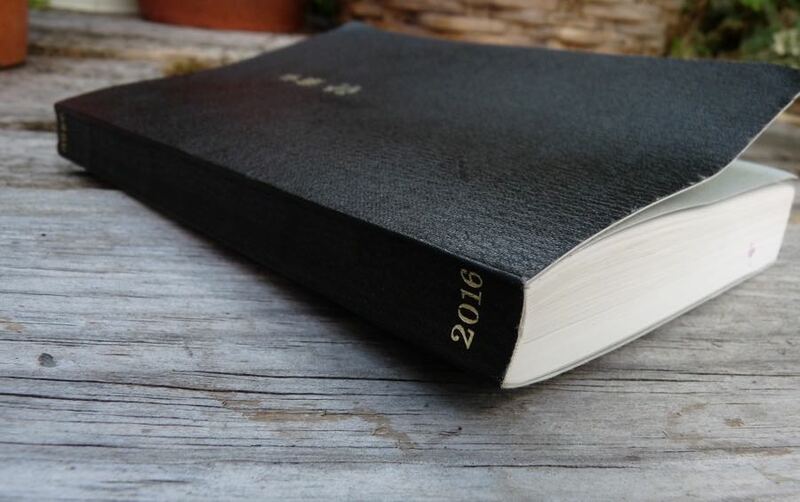 During 2016 there’s an extra page for the start of each month. When I remember, I use this to write down important events coming up, which is the closest I get to using the Techo as a planner. At the back of the Techo you get nine pages of dot grid paper and then: international size charts, in case you ever want to know your hat size in Japan (which assumes you know your hat size to begin with), unit conversion tables, a ruler, a map of Japan, a guide to Japanese dining, international dialling codes, and a list of international holidays. The last page has space for you name and address. There’s a lot here, as you can see. Something for everyone, as long as you have a use for a planner that gives you an A6 page of gorgeous paper every day. I’ll be getting one for 2017. They sound great. I was looking at getting the September 2016 to 2017 edition only yesterday but could not remember where to buy one. Good review Ian, I have tried and this is my third year owning one but I just can’t get in a rhythm past a couple months at a time. Still love writing in it. I like hearing about your 3 good things + 1 more! 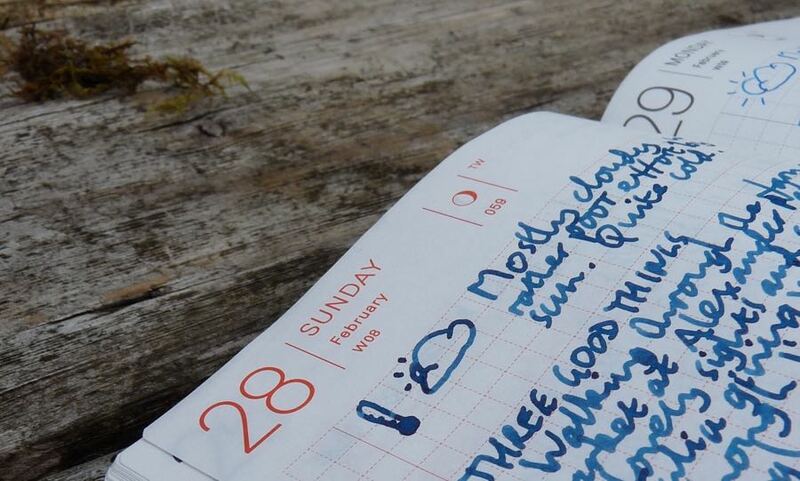 It’s an interesting structure for journaling that’s not intimidating. I got a Hobonichi for 2016 with high hopes. My intention was to use each day’s page to write a few sentences and make a small sketch related to my day. That lasted exactly 2 days. Now you know I’m an avid sketcher who has no problem sketching daily (and also an avid journal keeper), so why didn’t this book last for me? It’s because I couldn’t get over how see-through the pages are. It drove me nuts. So now I just use that fabulous Tomoe River paper to test inks in my fountain pens and look at the glorious sheen some inks produce. A very expensive scratch pad. But lesson learned!